They hear human sounds in the world beyond their screen, but ask them to repeat it back, and they would be stumped. It’s not just the device that is impeding discourse, it’s the type of attention that is being brought to bear—divided and distracted. The reflex is to both look at the phone and listen to the conversation, but doing both things at once is impossible. You can’t do more than one high cognitive task at a time, especially anything involving language, because there is only one neural channel for language to flow through. As a result, you are either doing one or the other task and switching back and forth between them. That switching has costs—time to figure out where you were on the task each time there's a switch, fractured attention, inability to retain information, rote behavior that results in mistakes, and stress. Multitasking forces attention down from the top floors of the brain, such as the prefrontal cortex, to the rote realms, like the hippocampus, which act on muscle memory. Thinking is sidelined for default action. Operating on rote mode is highly unproductive, as the data on multitasking shows. Productivity can drop from 40% to more than double that, according to David Meyer, a multitasking expert at the University of Michigan. Why would you want to work so ineffectively and scatter-brained? You wouldn’t—if you were thinking about it. But, alas, you’re not thinking about it. Almost none of us are. We are simply reacting, following orders from devices and interrupters. That means we are using a form of attention, bottom-up attention, that undermines focus and engagement and drives loss of control, stress, and overwhelm. Bottom-up attention is a survival instinct. When a car backfires, we stop whatever we’re paying attention to and focus on the source of the threatening sound. Blood pressure increases, thoughts are constricted to the intrusion, and we lose the fragile thought chunks held together in short-term memory that we need to get our work done. Then we have to reconstruct later what it was we were doing before the interruption. Research by U. C. Irvine’s Gloria Mark shows that it can take up to 25 minutes for your thoughts to get back to wherever they were before bottom-up attention took hold. Think of the hit to productivity that delivers multiple times a day. The reason so many feel overwhelmed today is that attention is being driven, not by what our brains were designed for—selecting one thing to attend to—but by the bottom-up world of the noisemakers and flashers. The chimes, dings, chirps, and pulses, along with visual notifications (impossible to resist flashing lights; could be a threat) that keep us in startle response mode, a defensive posture, instead of on the attention offensive. The key to restoring focus and productivity to the day is bringing back the kind of attention we need to get work done and concentrate: top-down attention. How do we do that? By setting the terms of engagement with the bottom-up brigade. That means creating strategies that put top-down attention in charge as much as possible. When we use the ability we are programmed with, to select and pay attention to one thing at a time, studies show we have more focus, less stress, we like what we’re doing more, and we remember it longer. All of that good stuff comes from full absorption in what we’re doing, from something that used to be known as undivided attention. Reclaiming it requires that we deploy perimeters around the unbounded realm of bottom-up intruders. Like a city without traffic lights, a workplace without boundaries on the incoming is anarchy, a field day for bottom-up dictatorship. When we’re not choosing what to pay attention to, and just reacting all day, we feel out of control, which is the root cause of overwhelm—a belief we can’t cope with demands. This is all your ancient brain needs to flip the danger switch of the stress response. It’s a huge attention saboteur, exploding working memory for a false emergency that constricts thoughts to the perceived crisis that isn’t one. The definition of stress is high demands and no control, what’s known as “latitude,” over the work environment. When we select what we pay attention to and when, we have command and control to keep overwhelm at bay. We can set the terms of engagement with adjustments to how we work, by checking email at designated times and keeping it turned off otherwise, by shutting off the noisemakers on our email and phone, by creating no-interruption “focus” zones that allow us to concentrate by using 100%, undivided top-down attention, and by many other strategies that restore control and attention. The average corporate email user gets 109 bottom-up emails a day. 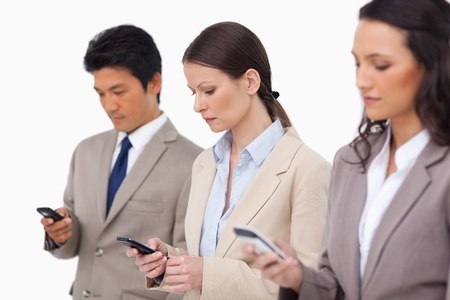 Business texts have increased 67%. An interruption of just 4.4 seconds can triple the risk of errors. How sustainable is this path and at what risk to safety and bottom-lines? There is a better way than terminal startle response all day. Putting the humans back in control. If your team could use more top-down attention and less bottom-up, more focus and less overwhelm, we can get you there with our Work-Life Balance and Managing Crazy-Busy Workload training programs. If you would like to learn more, click the button below for more details. Proactive self-management is the answer to overwhelm and growing attention deficit.